Conventional wisdom says that one should refrain from talking about religion and politics in public. Today, "public" includes Twitter, Facebook, Google+, blogs, and various other places online. It seems that I haven't learned my lesson. I have three degrees in religion, am working on a PhD in religion, and I cohost a podcast about religion. I also cohost a podcast about politics and, as many of you have noticed, talk about politics frequently on my blog, on Twitter, and on Facebook. The two things that one isn't supposed to talk about are pretty much all I talk about. So, why do I talk about politics so much (we'll deal with religion another day)? I know it can get tiresome and a little overwhelming, especially in the lead up to a presidential election. 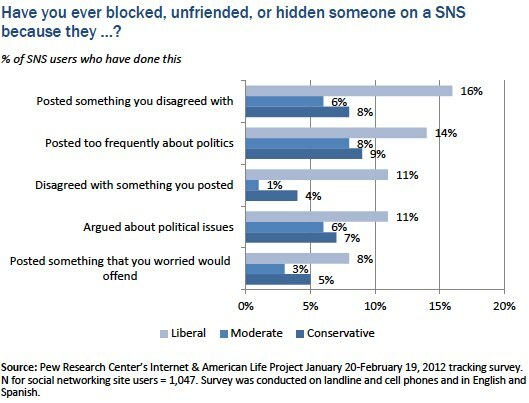 The Pew Research Center has released a study about social networking and politics and they have some interesting findings about people deciding to block, unfriend, or hide someone on a social networking site because of something they posted about politics. So, even when I know some people will hide my posts, unfriend me, or block me and many will just ignore what I post, why do I still post so much about politics? It's pretty simple, really - I think it matters. I mean, I think it really matters. Policy decisions made in DC, along with those made in our state capitals and in the cities and towns we live in really do affect our everyday lives. I also think that we have a responsibility as citizens to be an educated and informed electorate - a responsibility we too often shirk. To this end, I hope to cut through some of the common political talking points and present the facts as best as I can understand them. This may mean dispelling the idea that Paul Ryan is some sort of deficit hawk, because the evidence simply does not back this up. Or it may mean informing conservatives and liberals alike that both Paul Ryan and Barack Obama "cut" Medicare - Paul Ryan in his budget proposal and Barack Obama in the Affordable Care Act (aka "Obamacare"). Except neither one really "cuts" medicare by $716 billion. The Affordable Care Act slows the rate of growth in Medicare spending by slowing how much providers (hospitals, doctors, pharmaceutical companies, etc.) are paid and changing the factors that determine how much they get paid (quality over quantity). Paul Ryan slows the rate of growth in Medicare spending by the same amount by providing beneficiaries (those people who are recipients of Medicare) with less money over time through a voucher system. So, the reality in this situation is that neither party really "cuts" Medicare (and Obama certainly has not stolen from the Medicare trust fund as Mitt Romney has alleged), but the changes that they propose to the Medicare system have very really consequences in our lives. I would like people to be able to debate the real changes that could affect them instead of recycling talking points about who is throwing whom off a cliff. I know that politics often seems like a game, but in this case the score means something to the lives of Americans. There is no doubt that in this election I support the President and I think I have very good reasons to. I also think that a lot of other people should too and I'm more than happy to have those conversations, but the conversations are senseless if we're not going to educate ourselves about reality. I want to be able to make my mind up for myself so I seek out information devoid of talking points, independent analyses, and the actual sources (what a novel idea). It should also be noted that I don't support everything the President has done. I think the ACA should have gone further since he wasn't going to get any Republican support anyway. I realize that drone strikes cost less and tend to result in less civilian casualties than "boots on the ground," but I still have a problem with them. I don't like that Obama has stepped up deportations over the number Bush deported. I don't like that he hasn't pushed harder for money in education or that he is promoting STEM fields over the humanities - I know there are more jobs to be had in STEM fields, but the humanities also help make the world a better place. So, before I am accused of being a blind partisan, realize that I have many qualms with the Obama presidency. Yet, I agree with his fundamental vision of the country, namely, that the government can and does often provide resources and programs that make our lives better and that the government plays a necessary role in helping us police ourselves (see financial regulations). I fundamentally disagree with Mitt Romney and Paul Ryan's approaches, which assert that more money at the top is somehow better for everyone when there is no evidence to back this up and that government is almost always an intrusion into our "liberty" and we should have no government intervention in our lives because it impinges on our freedom, except, of course, when it comes to who can marry whom and what health decisions a woman can make. If you have to tune me out until after the election (or until classes start for me and I have much less time to engage in politics), then that's ok. I understand. But I also want you to understand that I don't just talk about politics all the time because I enjoy it (though I do) or because I'm blindly following a single politician or political party (I'm a registered Independent, btw), but rather because I think it is one of the few things that really matters, that has real consequences, and can change the course of someone's life with the stroke of a pen.